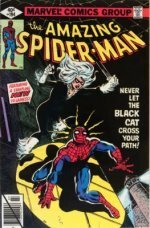 All Star Comics Price Guide: What Are Your Vintage Comics Worth? 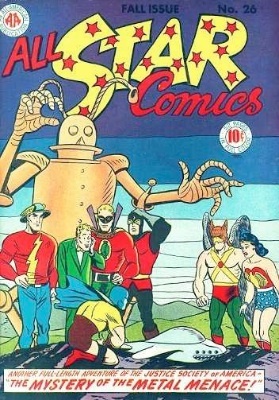 All-Star Comics began its run in Summer, 1940, published by All-American Publications, who would go on to become part of DC after the merger with National in 1946. 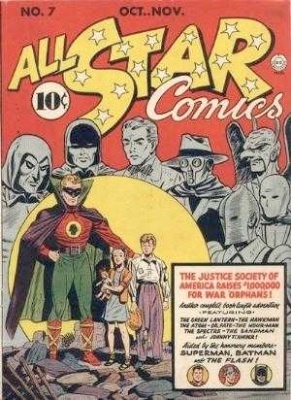 After beginning as an anthology series with a mix of adventure stories and superhero stories, All-Star would become the home of the Justice Society of America for the duration of its run. 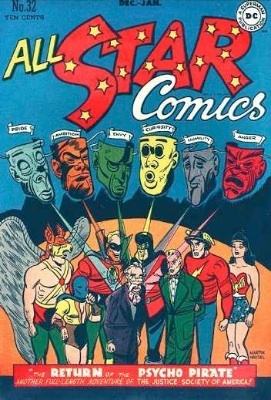 By 1951, as with most superhero comics barring those featuring Batman, Superman, and Wonder Woman, All-Star would be canceled, to make room for Western-themed comics. 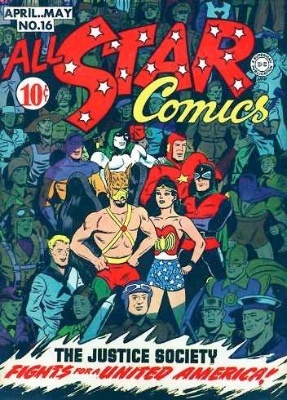 All-Star Comics #1 may have a lower value than issue #3, but that is not to say that it is not an important or historic, or valuable comic. In reality, it is all three of those. 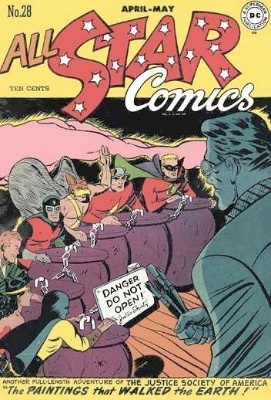 Like any Golden Age superhero comic, copies in good shape will bring in a considerable sum. 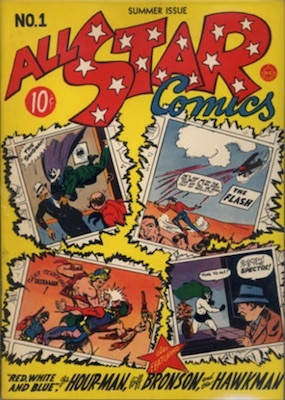 All-Star Comics began as an anthology series, primarily composed of superhero stories. 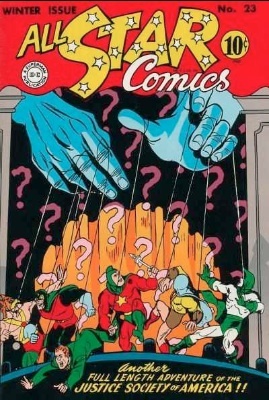 The first issue featured the Flash, Hourman, Sandman, Hawkman, the Spectre, and Ultra Man. 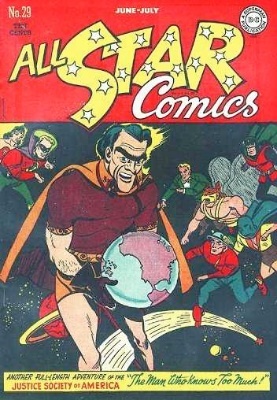 All save Ultra Man would become fan favorites, and while this comic is not the first appearance for any of these heroes, it did feature writing by Gardner Fox and Jerry Siegel and art by Sheldon Moldoff. 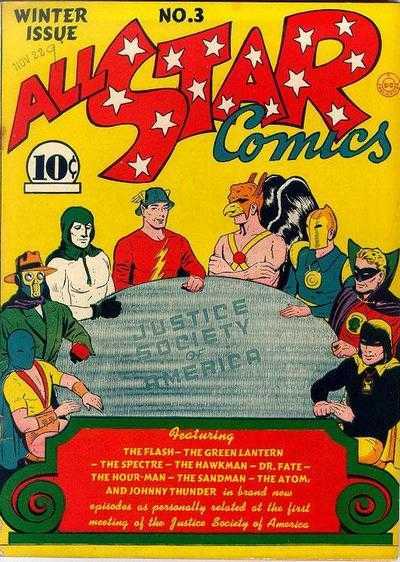 Issue #1 of All-Star is definitely a rare comic. Based on age, rarity, and early appearances by important characters, will command a significant price if you have one. 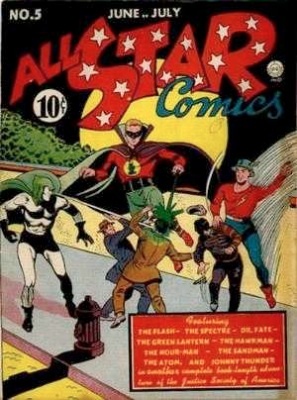 All-Star Comics #2: Flash, Johnny Thunder, Green Lantern feature. 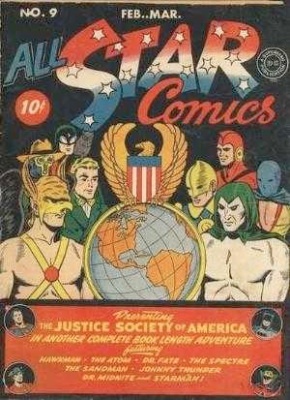 All-Star Comics #3 introduced the first super-team, the Justice Society of America, destined to be the template for the Silver Age's great super-team comics, especially the Justice League of America. 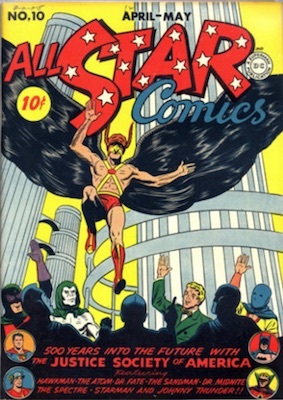 Written by Gardner Fox and illustrated by Everett E. Hibbard, this issue of All-Star shows the first group meeting between Green Lantern, Flash, Hawkman, The Spectre, Hourman, Sandman, Dr. 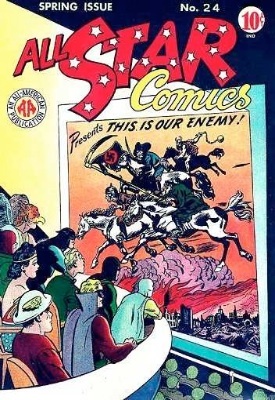 Fate, and the Atom, with Johnny Thunder and his magic Thunderbolt providing comic relief. Johnny Thunder asks each hero to tell the others about his most exciting adventure. Thus, this issue is more of an anthology than a group adventure. 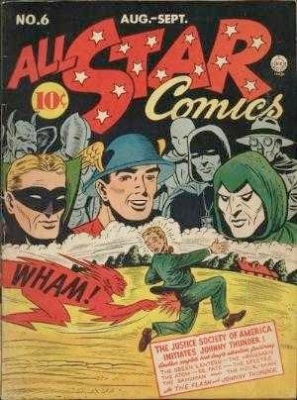 The JSA does not actually team up and fight crime as a unit in All-Star #3. Even so, this comic is rare and valuable. 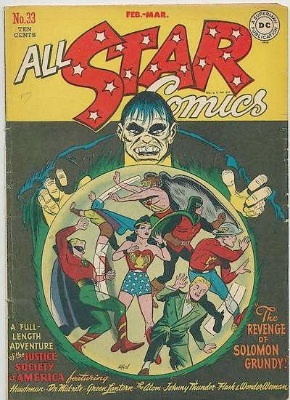 This is the key issue of All-Star before Wonder Woman's first appearance in #8. 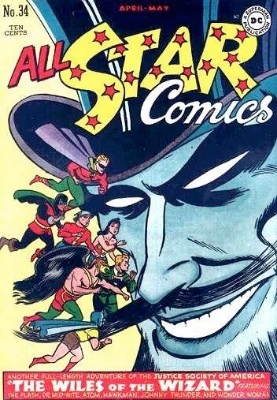 All-Star #4 marks the first time that the JSA actually fought as a team. Its historical significance is nearly as large as issue #3, and like #3, issue #4 can command a hefty price in top condition. 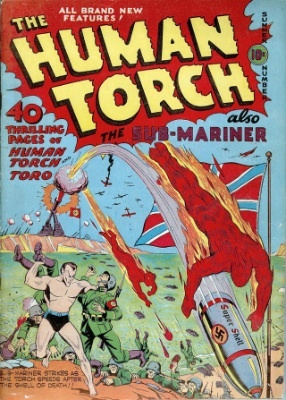 This issue straddles the anthology format and the group adventure format. 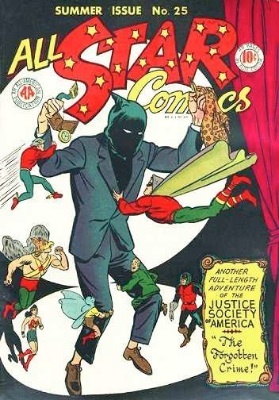 Each member of the JSA combats a separate but connected group of fifth-columnists around the country, coming together at the end to fight together to apprehend the mastermind, with an assist from Johnny Thunder's Thunderbolt. 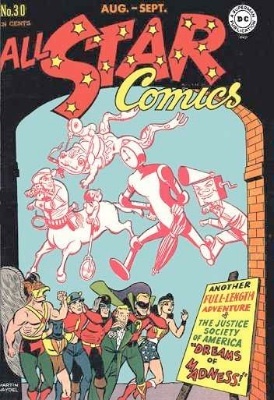 Featuring writing by Gardner Fox, and art by the likes of the top artists working for All-American at the time, including Martin Nodell and Sheldon Moldoff, this issue of All-Star is very desirable to collectors. 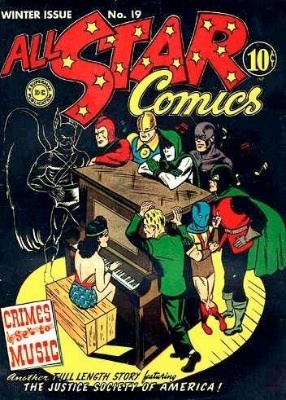 As odd as it may seem, Batman and Superman had never encountered each other by the time All-Star #7 appeared in October of 1941. 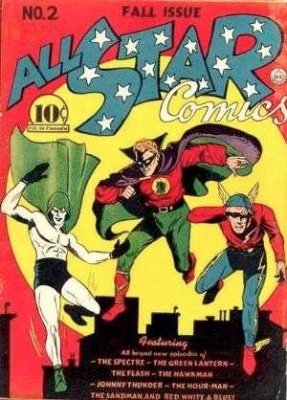 Both characters were owned by National Periodical, and could have met any number of times, but it took the first super-team comic to make it happen. 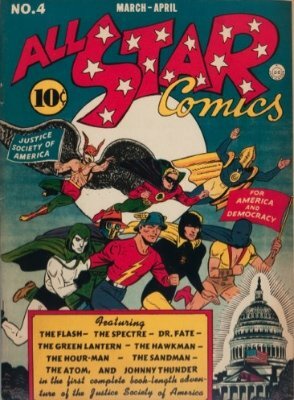 In this issue of All-Star, the two biggest heroes of the era joined the JSA, but only appear in small cameos, along with the Flash, on the cover. 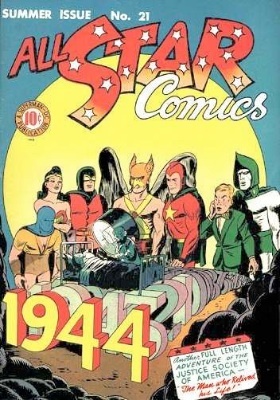 This may be due to the fact that Batman, Superman, and Flash were owned by National, and All-Star was owned by All-American, and while the two companies had an "arrangement", they would not merge until 1946. 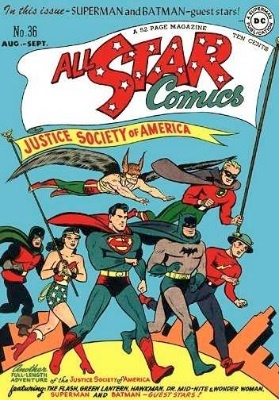 In this issue's story, the JSA pledge to raise $1,000,000 to help war orphans in Europe, then a very popular charitable cause in just-pre-WWII America. With the advent of war in December of that same year, things would change. 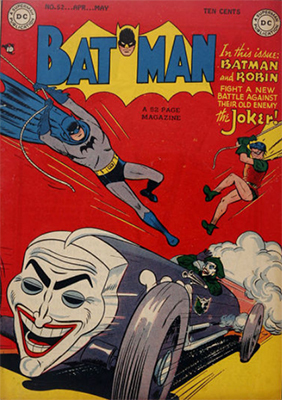 Written as usual by Gardner Fox and illustrated by Everett Hibbard, this issue commands quite a sum, owing to the first meeting of Superman and Batman, and to their guest-starring roles. 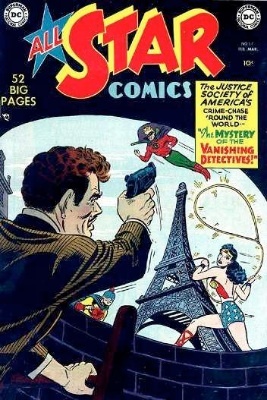 One thing that All-American Publications had been lacking was a popular female superhero. There had been several in the Golden Age, starting with Sheena, queen of the jungle, but none had made a lasting impression. 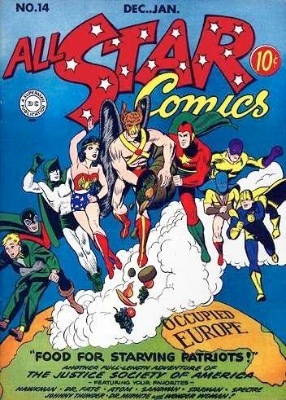 None, that is, until Wonder Woman made her debut appearance in the pages of All-Star Comics #8, alongside the Justice Society of America. 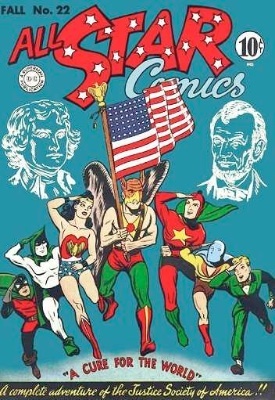 This major milestone adds significantly to the value of what would already be a valuable early Golden Age comic, along with the addition of two other heroes to the JSA lineup: Dr. Mid-Nite and Starman. 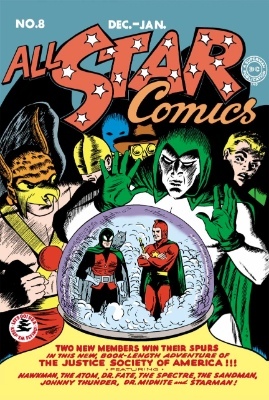 The two new male heroes join the JSA in the main story, Two New Members Get Their Spurs, as depicted in the iconic cover art by Everett Hibbard, which shows the Spectre enigmatically revealing Dr. Mid-Nite and Starman in a crystal ball. 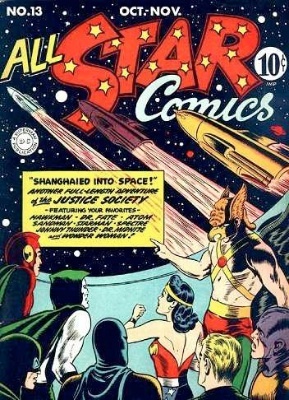 The Wonder Woman story was relegated to second feature, and tells the story of Army pilot Steve Trevor crash-landing on Paradise Island to find a race of Amazons. 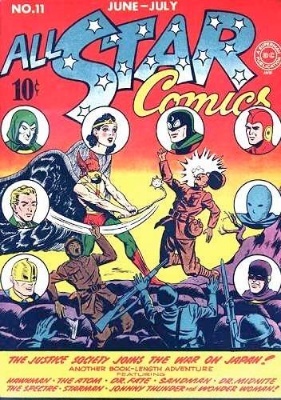 Trevor tells their Queen, Hippolyta, about the Allied struggle against the Nazis, and she agrees to send an emissary to help fight. Click any image below to check values of these issues. 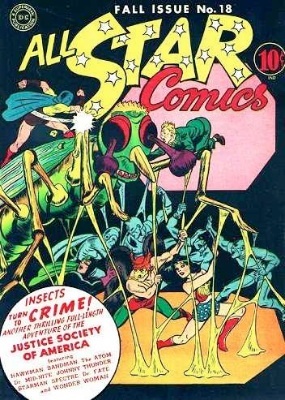 Perhaps the last issue of All-Star to be considered 'key' is All-Star Comics #36, with Batman and Superman guest-starring together for the first time since issue #7. The appeal of these two heroes cannot be denied, and adds significantly to the value of this comic. 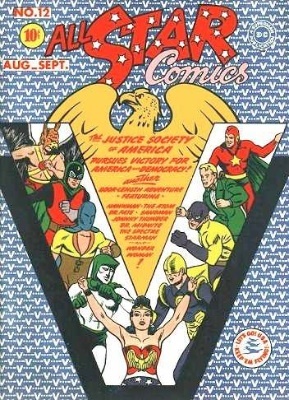 Issue #36 dates from August, 1947, after the merger between National and All-American, and now the famous guest-stars are featured quite prominently on the cover, seemingly being honored in a parade by the JSA. 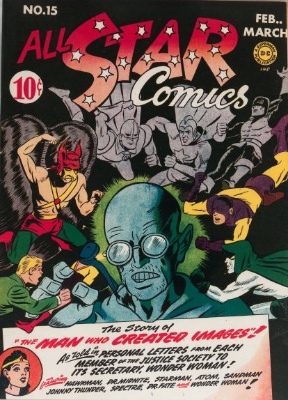 With a script by Gardner Fox and art by Irwin Hasen, this issue of All Star Comics commands quite a hefty sum when it comes up at auction, mostly due to the prominent appearances of Clark Kent and Bruce Wayne's alter egos. In recent years, "sunset" collecting has become popular. 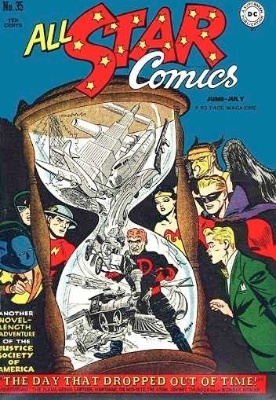 The final issue of a run, or the final appearance of a character, is sought after by sunset collectors. There is usually a reason to cancel a series; often sales were declining to the point where the comic book was no longer profitable. This makes some sunset comics much scarcer than the issues immediately before them. 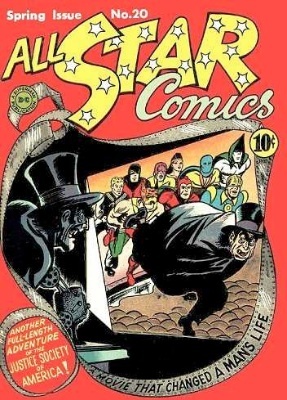 All-Star Comics #57 is definitely a scarcer comic book, and prices reflect this if you happen to find one. 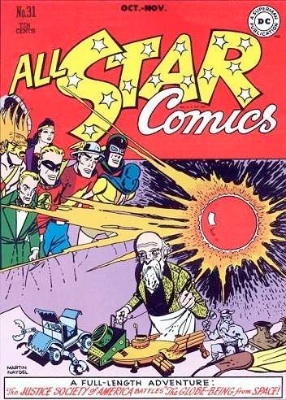 And so the run of All Star Comics ended. 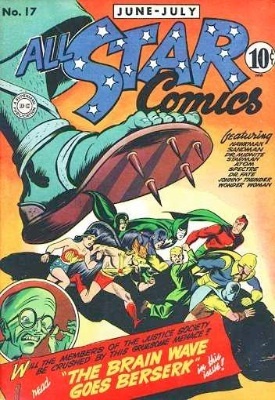 The series that had launched the first superhero team in the Justice Society of America, and debuted Wonder Woman, finished. 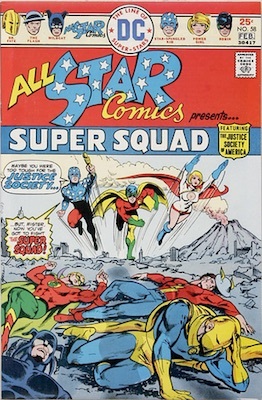 The series relaunched with this "Super Squad" issue, which also features the first appearance of Power Girl. It's on our 100 Hot Comics list. 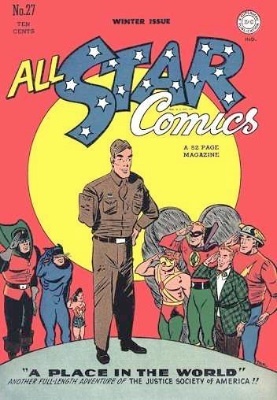 Have Your All Star Comics Valued Free! 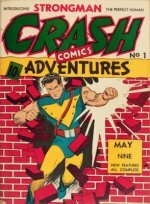 Contact Sell My Comic Books if you have vintage All Star comics. We'll value them for free, and offer you a Dollar amount if you wish to sell. Find out the individual value of characters appearing in All-Star, including Wonder Woman, Batman, Superman, the Green Lantern and more. 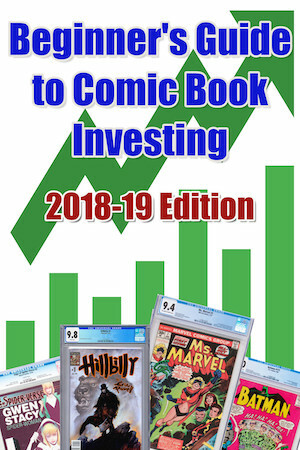 Find out which are the world's rarest and most valuable comics, and what yours might be worth if you're lucky enough to own one of these early and valuable books! Find out what early and key appearances of the lovely super-heroine are worth, and get yours valued if you own one or more of them.